Get ready, one of the biggest rappers in the world right now is coming to Inglewood, California – that’s right, ladies and gentlemen, it’s Jay-Z!! Four years after the release of his incredible “Magna Carta Holy Grail”, Jay-Z has dropped a brand new album, the critically acclaimed “4:44,” and a tour to accompany it!! He’s coming to The Forum on Thursday 21st December 2017 – get ready for a show that will blow your mind! 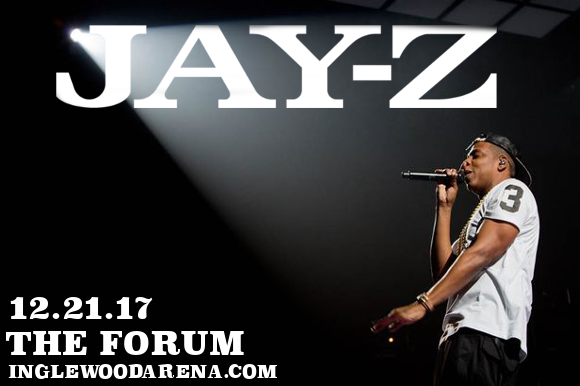 Don’t delay – book your Jay-Z tickets NOW while they last!! One of the best-selling musicians in history, with sales of over 100 million records worldwide, the winner of no less than 21 Grammy Awards, and rated by MTV as the "Greatest MC of all time,” the impact, influence and lasting success of Jay-Z (the stage name of Shawn Corey Carter) can’t be understated!! Since his last album, his 10th to reach number one on the Billboard Hot 100, fans have been foaming at the mouth for a new release. Up till now Jay-Z has kept his creative output to guest appearances on songs by other artists, including Beyoncé’s ”Drunk In Love", Jeezy’s "Seen It All" and Rick Ross’ "Devil Is a Lie” – that is until the sudden release of “4:44,” on June 30th, exclusively on Jay-Z’s streaming service Tidal and to Sprint users! Be among the first to hear all the brand new material live – book your tickets to see Jay-Z live today, while you still can! !